Viv and I had entered The Fair earlier in the day and hit up all the usual things like the prize home, Whales Tails, Foot Long Hot Dogs and lost a bunch of money trying to win little useless stuffed animals. 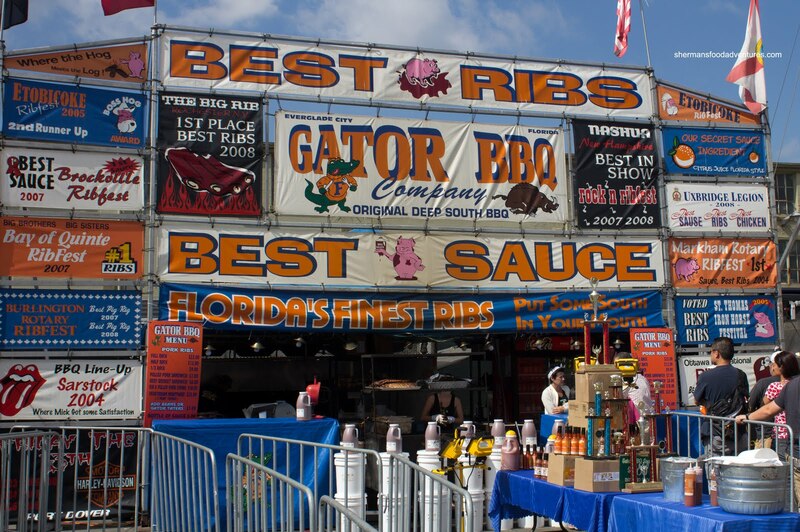 For lunch, we gave Gator BBQ a shot first. In order to do a proper assessment, we got the Vegetarian's Nightmare platter consisting of Pork Side Ribs, Pulled Pork and Beef Brisket. Hailing from Florida, their booth was full of accolades and awards. I found their ribs to be dry and chewy in some spots due to the use of side ribs. Unfortunately, we got the wrong end of the rack where there was little bone and lots of cartilage. The pulled pork was super moist and not stringy. Now as for the beef brisket, it was dried out and rubbery. The BBQ sauce had a nice consistency and was quite sweet. Later on in the day, Rich Guy joined us for the Hall & Oates concert and helped try 2 more of the competitors. We decided to hit up the 2 with the longest lineups. 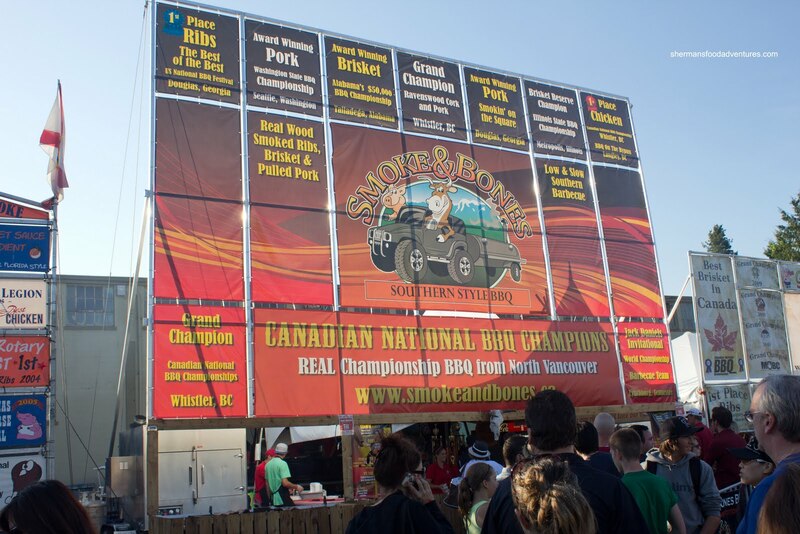 Hence we ended up missing out on Crazy Canuck Smokers and QN4U BBQ House. The longest line belonged to Smoke & Bones and it took me 30 mins to get my food. I got their Seymour Platter consisting once again of Beef Brisket, Pulled Pork and Pork Side Ribs. 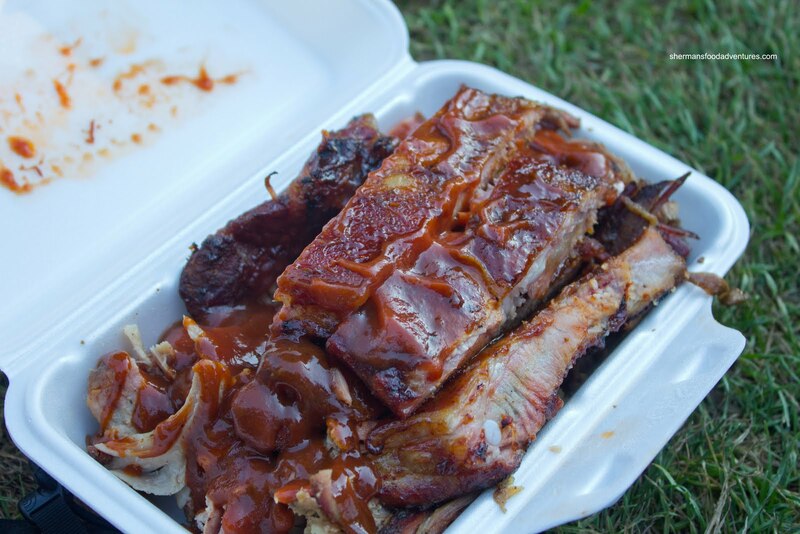 Inexplicably, they used a smaller styrofoam box which barely fit all of the meat. Anyways, the beef brisket was actually hand-pulled rather than sliced. Consequently, it was slightly stringy. It still was moist though. The pulled pork was good, equally as good as Gator in my opinion. 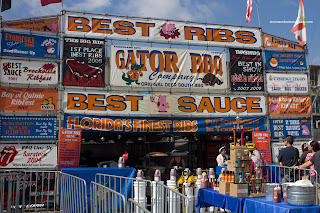 It was very moist, in large strands and the accompanying BBQ sauce had more smokiness and zing than Gator. 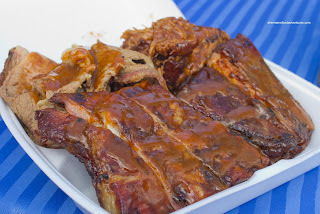 Once again, we got the wrong end of the side ribs and the meat was slightly chewy, but more moist and tender than Gator. Being a bit redundant, Viv got the Pulled Pork Sandwich. As you can see, it was a large amou nt of the same tender pork with crisp coleslaw and tangy sauce. She thought it was good and a great value at $7.00 (it's that much outside the PNE!). 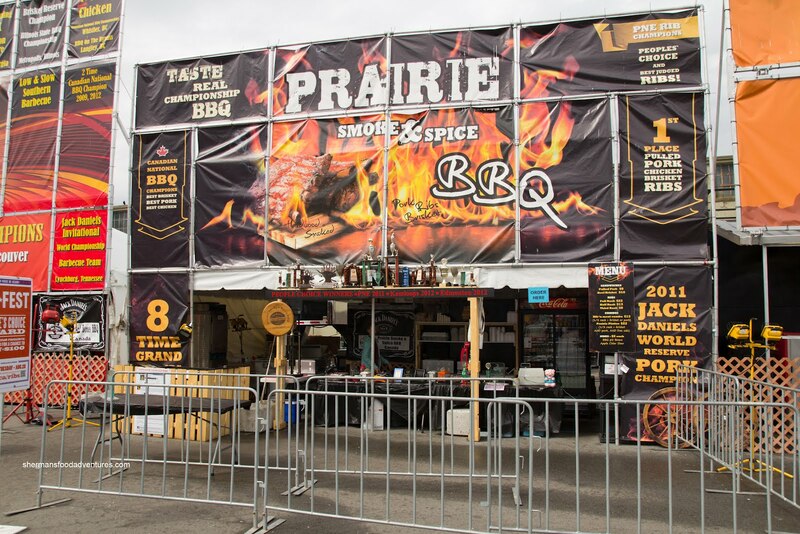 The next longest lineup belonged to Prairie BBQ which we were fortunate enough to snag the last few ribs since they were still smoking the next batch. Not sure if they were trying to rush the Ribs or not, but they were chewy and appeared to lack cooking time. At the very least, we got the right side of the rack this time with the whole bone, rather than cartilage and fat. Despite its dry appearance, the Pulled Pork was moist and flavourful. We would've preferred it be in bigger strands though. The best part of this platter was the Beef Brisket. It had a nice bark which was smoky. The meat itself was melt-in-our-mouths tender. We liked this brisket more than Gator and Smoke & Bones. As for the limited amount of BBQ sauce (Rich Guy didn't notice any squeeze bottles around from Prairie), it was a bit hard to taste it. From what we could gather, it was smoky and not as sweet as the other 2. So there you have it. 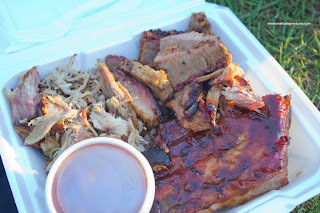 We tried 3 of the competitors and concluded that brisket = Prairie, ribs = Smoke & Bones and pulled pork = Gator or S&B. 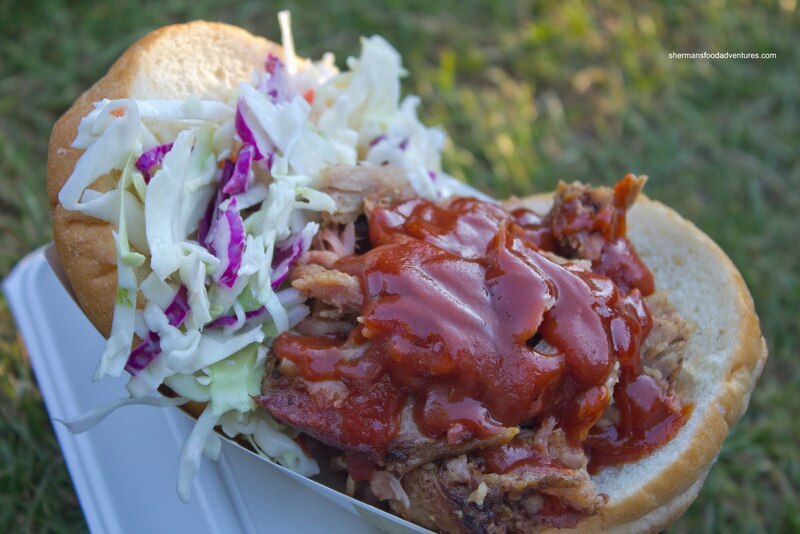 Overall, a great value since all of the pulled pork sandwiches are $7.00 and the meat platters are $22.00. At the end we didn't care since the Hall & Oates concert was awesome. We turned from ribeater to maneater (the song! for those pervs...). 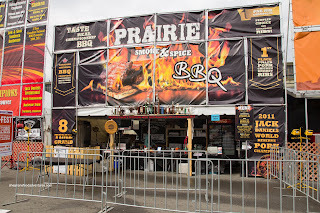 I had the brisket from the prairie place and it was melt in your mouth delicious!!! Totally worth the 8 dollars! Did you get a chance to try the 2 foot long hotdog??? @mbsunshine Yah! The brisket was awesome! No, the 2 foot long hot dog would've cut into my BBQ!